Field trials of the Harrington Seed Destructor (HSD) in South Australia, New South Wales and Victoria have shown the weed-management device is as effective at managing annual ryegrass in the east as it is in the west. Supported by the GRDC and the Rural Industry Research and Development Corporation, the trials at the 15 sites in the eastern states began during harvest in November and December 2011. They were supervised by the University of Western Australia’s Associate Professor Michael Walsh, a member of the Australian Herbicide Resistance Initiative (AHRI). The HSD is a cage-mill implement towed by the harvester and incorporates chaff and straw transfer systems. The weed seed-bearing chaff fraction is processed by the mill before being returned to the field. In autumn this year, the trial sites in the eastern states were revisited and ryegrass counts conducted to assess the impact of the harvest weed seed control systems on the annual ryegrass population. Results from these counts show the HSD had the same affect on annual ryegrass populations as in WA trials in 2010. And as previously seen in WA, the level of control for the HSD matched other prevailing weed seed control systems – windrow burning and seed collection with chaff carts. While the HSD’s efficacy matches that of these other methods, he says the advantage of the HSD is that it does not require burning of residual waste, saving time and avoiding additional damage to soil. 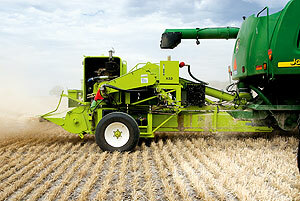 The HSD was invented by WA farmer Ray Harrington as an alternative to windrow burning and chaff carts. He was supported by the GRDC, the University of South Australia and AHRI in its development. The GRDC is now managing the HSD’s commercial development and the invention will be manufactured by de Bruin Engineering of Mt Gambier, SA. There are three HSDs in existence. Apart from Mr Harrington’s two on-farm machines, there is a research and demonstration model used by Associate Professor Walsh and the AHRI team. This model will be on loan to farmers in the mid-north region of SA for this year’s harvest. Read this article in GC Supplement issue 100 - Subscribe and recieve the hard copy of GroundCover in your mailbox for free, remember to select 'Post' as your subscription method.